Thank you to everyone who joined us in Los Angeles in January! We loved seeing you and catching up. Want to know where we are headed next, or want us to come your way? Check out upcoming events or drop us a note on the alumni page. Open your children's eyes—and your own—to a whole new way of learning. Curious Minds is an education series for parents and children ages 18 months to 4 years. The free sessions, held from 9-10 a.m. in the Lee Community Room, provide tips and ideas on innovative ways to enage and excite your children. Join us on Thursday, April 5, for Self-help Skills Every Child Should Know, featuring USM's prekindergarten faculty Muffie MacKedon Browne and Jennifer Keppler. Did you know? Children of USM alumni who attended for four or more years are eligible for financial assistance from a scholarship fund provided through the generosity of Polly MDS’38 and Henry Uihlein MCD’39. 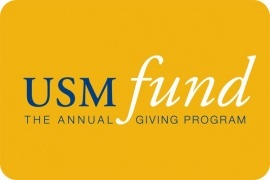 The Polly and Henry Uihlein Alumni Scholarship Fund, in addition to other financial aid opportunities, is intended to assist those students whose families might not otherwise be able to fully cover the cost of a USM education. If you have any questions, please contact Eric Peters, director of enrollment management, at epeters@usmk12.org. Are you a group text master? Love promoting USM? Want to become more involved with the Alumni Association? If you answered yes, then we are looking for you! The Alumni Association is looking for alumni to act as ambassadors of our school and liaisons to their classes. Please email alumni@usmk12.org with questions and more information. Wondering what campus looks like since construction has started on the performing arts center and the Jack Olson '67 Commons? Take a look at this brief video showing the progress from the ground up. Visit the Our Common Bond website for more information. USM is coming to Larkspur, Palo Alto, and San Fransciso, and we hope to see you there! Alumni Night at the Theatre, 7 p.m.
Reconnect with alumni and parents of alumni for "A Chorus Line" in the newly renovated Virginia Henes Young Theatre. Enjoy pre-event festivities in the Kohl Collaboration Center. Paddle Tennis Mixer, 6-10 p.m. 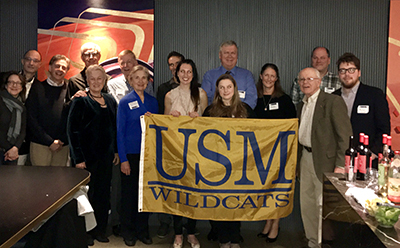 Hosted by Charlie Wright '04 and the USM Alumni Association at Town Club in Milwaukee. Join the USM community at the ICE Ball! This sophisticated, visual, and sensory fundraising party represents everything that makes our school—and our students—exceptional. The evening will feature student performances, dinner, creative cocktails, auctions, and live music, and the attire for this evening is fashionably fun cocktail attire. Proceeds from this event benefit the Our Common Bond campaign. Tickets, which include all food and beverages, are available for $250 per guest and can be purchased here. USM Reunion Weekend and Inaugural Food & Froth Fête. Here is an idea you may find helpful, especially in light of the changes resulting from the passage of “The Tax Cut and Jobs Act of 2017.” If you own appreciated stock, you may want to consider donating some shares to USM instead of making cash gifts. If you continue itemizing your tax deductions, you could claim an income tax charitable deduction for the current value of stock you donate. (You must have held the stock for more than one year.) The added benefit—even if you no longer itemize deductions—is that you pay no capital gains tax when you donate stock to USM.